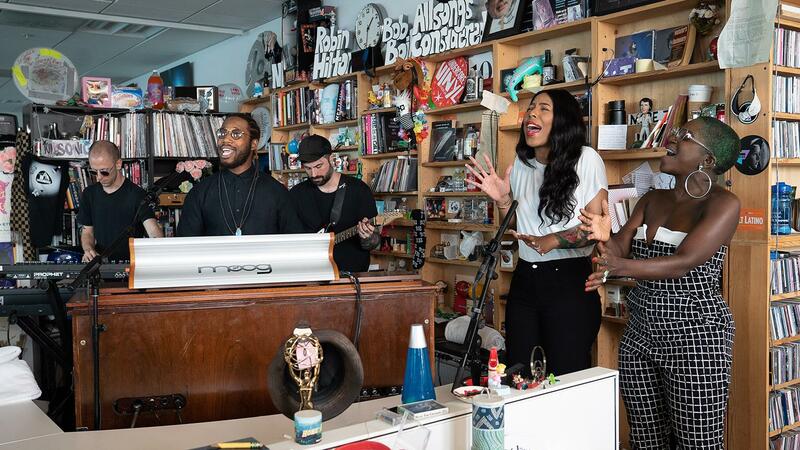 Cory Henry performs a Tiny Desk Concert on Sept. 7, 2018 (Claire Harbage/NPR). Cory Henry's name belongs in the same breath as the Hammond organ masters of the past. The instrument creates the central sound of his dynamic, neo-soul- and funk-infused musical identity, and he opens his turn behind the Tiny Desk with what feels like an encore: the full-on soul assault of "Love Will Find a Way." The song twists and turns, then winds up as a full-on celebration — and it's only the first song in his set. Henry's keyboard skills are on full display during a synth solo in "Trade It All," which also spotlights his entire band. To my mind, they'd have sounded right at home on Stax Records in the '70s — no small accomplishment. "Send Me a Sign" then showcases some of the roots of Henry's songwriting; it's inspired by church sermons that bloom into group sing-alongs. Just another way Cory Henry digs way back to give us something new and exciting.